"I shall be the king of Jurai!" The above info came from Kaylah Case (Dot Matrix), and was edited by yours truly (contact me). The image came from Kagato. Kagato Jurai was once a swordsman whose skill was well renowned throughout the Jurai empire. Some said that if things hadn't turned out the way they did, Kagato might have been renowned as Jurai's greatest swordsman. But Kagato had became overly obsessed with refining his own Jurai power, and challenged many people to duels... and won. As his obsession grew, he began to lose more and more of himself. Finally, his brother Yosho had challenged him, in which Yosho had won. Kagato had later disappeared into the darkness of the galaxy, building his own dark Jurai power until he felt he could return to Jurai and claim the throne. By then, Yosho had already left Jurai with Haruna for Earth. It was a simple matter years later for Kagato to claim that HE was Yosho. Kagato then arrested or killed all the other claimants to the Jurai throne... all except Ayeka and Sasami. Since he knew that the two princesses were on Earth, he sent a Jurai battleship to arrest them. They did so by transporting up the Masaki house, where they confronted Ayeka. Ryoko was also arrested for her crimes. But later, with the help of Mihoshi and Kiyone, Tenchi, Nobuyuki, Washu, and Katsuhito had rescued them. Kagato had found that, after a lengthy pursuit, that the fugitives had settled in what used to be the old palace. It was there that Kagato had once again challenged Yosho, who was now the elderly Katsuhito Masaki. This time Kagato had won, wounding Katsuhito in the process. Kagato then took on Ryoko and wounded her as well. Afterward, he had captured Ayeka and took her to Jurai, leaving Tenchi to rescue her. 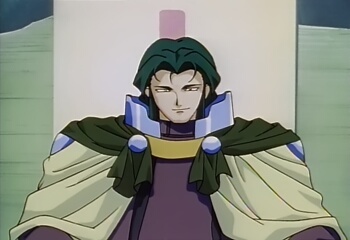 After Tenchi (with the help of a wounded Ryoko and the knights Azaka and Kamidake) entered the palace and confronting the evil knights Tetta and Tessei, he confronted Kagato. At first, Kagato's might was too much for Tenchi. 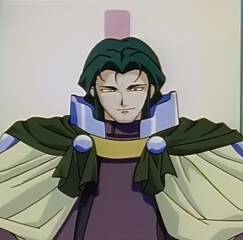 But after Ayeka had used her power to intercede, the whole of the Jurai power had recognized Tenchi as the true heir to the Jurai throne. Thus empowered, Tenchi once again faced Kagato... and this time defeated him. As Kagato knelt dying, he turned and saw the image of a youthful Yosho in Tenchi, and with his last words said, "Yosho, looks like I've lost again," then he died. When Kagato claimed to be the emperor of Jurai, Yosho (Tenchi's grandfather and Ayeka's brother) was sent to fight him. Kagato was defeated, but not dead. A long time passed, and eventually he came back to claim his royalty once more. Yosho tried his best to defeat him again, but this time he defeated Yosho...and kidnapped Ayeka. Now Tenchi was to carry on and defeat Kagato for the sake of the universe! The above description came from Kaylah Case (Dot Matrix), and was edited by yours truly (contact me).